Montpelier VT, April 2009- We know how things stand . The recession is teetering on a New Great Depression; many say we are already there. Tens of thousands of Vermonters are out of work. Thousands more are slipping into severe poverty. Nonunion workers are losing their jobs and having their benefits gutted, while union workers are facing layoffs, pay cuts and increases in their health care costs. Republican Governor Douglas has reacted by calling for mass layoffs, a decrease in unemployment benefits and cuts in social services; all at a time when we need jobs and services more than ever! Up until now, working Vermonters have been on the defensive. But, as a District Vice President in the Vermont AFL-CIO, I am here to say this is about to change. No longer are working people willing to pay for the greed and failures of the capitalist class. No longer will we stand by as Wall Street tycoons squeeze more profit from a broken system at the expense of our jobs, our health care, and our lives. In a word, working people are preparing to go on the offensive in the fight for a dignified way of life, and the Vermont AFL-CIO is ready and willing to stand by these folks wherever they may be. On May 1, thousands will march upon the Capitol in Montpelier not only to insist that our jobs and services be made safe, but also to demand that all Vermonters be provided with health care now! The Vermont Workers' Center, with a constituency of over 25,000, has been organizing towards this rally for months as part of their "Health Care is a Human Right" campaign, and is boldly calling on people to "call in sick" and for small businesses to "voluntarily close down" in order to support the mass action on the 1st. The Vermont AFL-CIO, with our 10,000 members, has endorsed this day of action and is calling on our rank and file to take a "personal day" to attend the demonstration. We project that the May 1st demonstration will be of historic proportions. It will be the first shot fired in a battle to reclaim Vermont for the working man and woman. So on Friday, May 1, stop whatever it is you are doing, and at 12 noon converge at the State House in Montpelier. It is time for working people to stand together and say "enough is enough!" "Health care is a Human Right" and we oppose the profit driven private insurance companies that make billions off of our sickness. We need a Vermont based single-payer health care system now, and we intend on winning it! This article was first printed in the Rutland Herald in April 2009. 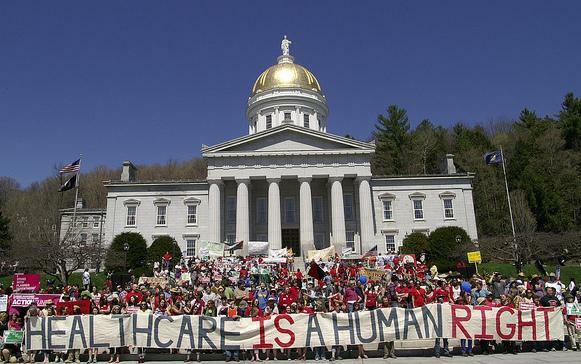 The Healthcare Is A Human Right campaign resulted in legislation being passed in the Vermont General Assembly in 2011 which set a mandated road map for achieving this by 2017. However, Democratic Governor Peter Shumlin, who publically supported single payer and made it a major leg of his electoral campaigns, killed the legislation shortly after winning his third term in 2014. Shumlin did not seek reelection in 2016. The author, David Van Deusen, was a co-founder of the Green Mountain Anarchist Collective.